An order to this effect was issued by District Magistrate, Keerthi Jalli on Saturday. 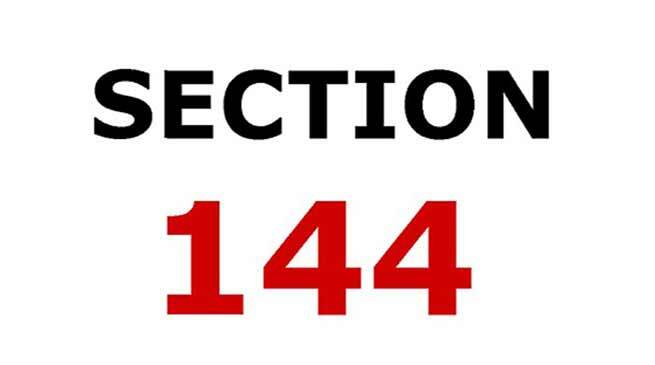 Section 144 CrPC has been clamped in all the examination centres where HSLC, AHM and HS final examinations will take place across Hailakandi district. The Higher Secondary final examinations conducted by the Assam Higher Secondary Education Council will begin tomorrow while the High School Leaving Certificate and Assam High Madrassa examinations conducted by the Board of Secondary Education Assam will commence from February 14 next. Apprehending serious breach of peace and tranquility and unlawful interference, District Magistrate Jalli stated, in the order, that Section 144 has been clamped within 200 metre radius in all the 16 examination centres in view of adoption of unfair means in previous examinations, law and order situation arising out of interference of general public, litigations in courts and lack of discipline by the authorities of the institutions and remoteness of some centres. The order prohibits the entry of unauthorized persons or unnecessary crowding and carrying of unsolicited materials, mobile phones and other electronic gadgets by the examinees to the examination centres. The order will remain in force till the examination process is over on March 14. This year a total of 7,002 candidates are appearing in HSLC and AHM and 3,727 in HS final examinations in Hailakandi district. Jalli has conveyed her best wishes to the examinees and sought cooperation from one and all for conducting the examinations in a free and fair manner. Meanwhile, Inspector of Schools, Rajiv Kumar Jha informed that altogether 21 academicians have been engaged as supervising officer and three flying squads have been formed for smooth conduct of the examinations. A control room has also been set up at the Office of Inspector of Schools with contact numbers 6002359169, 9435377319, 9435371789 and 7002154955. Jha said that Deputy Commissioner, Keerthi Jalli and Superintendent of Police, Mohneesh Mishra will personally supervise the entire examination process.